This photo was originally on the ‘Do You Know Page’ of this website but thanks to P Heywood for the following. The "Louth" bus on your ‘Do You Know Page’ is a Great Northern Railway (Ireland) bus which I think had its main bus operations in Drogheda (County Louth). Their first bus service (feeding into their railway route from Belfast to Dublin) started in 1929 and finished in 1958. 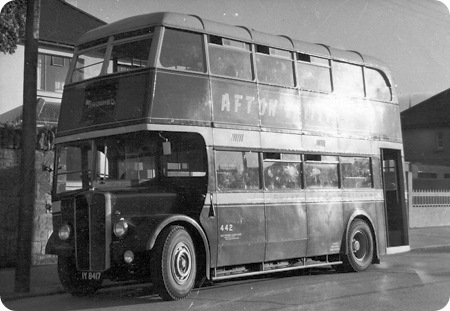 Although they were basically a "Northern" company, they managed to keep their presence in the south after partition by continuing to build and maintain rail and bus equipment in their large workshops in Dundalk (just south of the border) which is probably where this bus was built. Their services were taken over by CIE in the south and Ulster Transport Authority in the north. If anybody has any other information regarding this particular bus please get in touch. In the book ‘CIE Buses 1945-1987’ there are two pictures of AEC Regent IIIs of similar outline operating with CIE. One shows 1948 bus AR437 (ZH3936) at Drogheda Bull Ring in full CIE livery, which looks identical in body design to 442 shown above. The other depicts AR294 (IY5396) at Eden Quay, Dublin, still in GNR livery but with CIE ‘flying snail’ emblem on the side. Although the bodywork looks broadly similar at first glance, AR294 has fixed glazing in the upper deck front windows, and is of 5-bay construction. However, in both cases the bodybuilder is given in the captions as Park Royal. I did wonder if they may have been built by the operator on Park Royal frames, or were they delivered as complete vehicles? Either way they certainly looked most handsome vehicles. 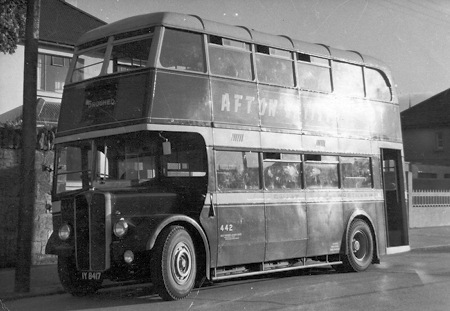 This bus was one of three built at Dundalk Works on Park Royal (London) frames, fleet numbers 440, 441 and 442. They were 7’6" wide 56 seaters and were based in Drogheda and Dundalk, although occasionally made forays to Dublin. They lasted in service with CIÉ until 1968. These 3 buses were very similar to 7 others which were built by Park Royal in 1948, fleet numbers 433 to 439, which also lasted until 1968. One of these, no. 438, is preserved by the National Transport Museum and on display in Howth. Nine 8’0" wide 66 seater buses, 299 to 307, were built at Dundalk Works on Park Royal frames around the same time as 440-442 and these were based in Dublin, Dundalk and Drogheda, although two of them, 300 and 305, were destroyed in the Dundalk Works fire in 1955. No. 306 was the last ex-GNR double decker left in service, being withdrawn in 1970. It would not be correct to describe the GNR(I) as a "Northern" company, it was formed at a time long before Ireland was partitioned, its Head Office was in Amiens Street, Dublin and its main Works was in Dundalk and some other managerial functions were based in Great Victoria Street, Belfast. Its area of operations was roughly north of a line from Dublin to Sligo and it even operated extended Coach tours which covered the entire Country! John, thanks for the extra information regarding these delightful buses. My comment about GNR(I) being a "northern" company is of course true in the sense that most of their mileage after partition remained north of the border. This must have created very many difficult political and business anomalies. The fact that their head office and works remained in the south was a direct consequence of their Belfast-Dublin trunk route. Their railway network was savagely afflicted by the international border which meandered to and fro over some of their routes (or maybe it was the lines that meandered to and fro over the border – but the railway was there first!) Having closed all except the Dublin – Belfast main line, GNR(I) was no longer a network, and I guess it was logical to divide it at the border between CIE and UTA.